Neighbor to Neighbor members are headed to the People’s Action Founding Convention in D.C. on April 23-25, 2017 to mark the 100 days of the Trump administration. The only question is: how many of us will represent Massachusetts’ progressive New Majority? With your help, 50 N2N members can show up and rise up in solidarity, defiance and resistance with other activist leaders against the Trump regime. You can make this happen by supporting our GoFundMe Campaign with a generous donation or by sharing our campaign with your friends and families. 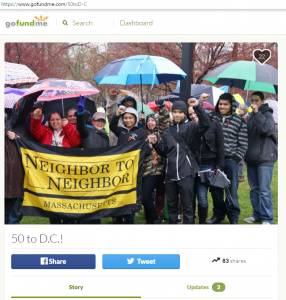 Donate here — www.gofundme.com/50toD-C — or share the link! The time is now to build power.